ISLAMABAD: The Pakistan Tehreek-e-Insaf (PTI) led government has given one month’s time to the management of Radio Pakistan to table a plan to bring out the state-run broadcaster from the financial crisis it is currently facing. 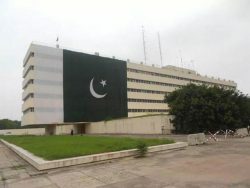 The federal government had given directives t lease out Pakistan Broadcasting Corporation headquarters building in the federal capital. However, the one month relief after a meeting held between Federal Minister for Information and Broadcasting Fawad Chaudhry , Radio Pakistan management and representatives of employees union. 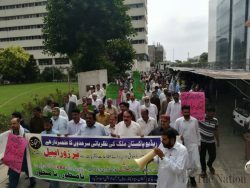 Employees of Radio Pakistan staged a protest demonstration outside the PCB headquarters and demanded that the government take back its decision otherwise they would lockdown the entire building. Talking to The Express Tribune an official privy to the development said that the government’s plan to lease out the building is still in place. He added that the process of compiling a feasibility report on shifting the PCB building to Pakistan Broadcasting Academy (PBA) has been halted by the Radio Pakistan’s internal staff. 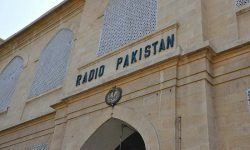 Meanwhile, a notification has been issued by the PBC, stating that shifting of the Radio Pakistan headquarters “may please be treated as withdrawn”. Later on, Federal State Minister for Parliamentary affairs Ali Muhammad Khan told the protesters that “for the time being the government has taken back its decision of leasing out the Radio Pakistan building”. He said that Radio Pakistan is a much valued institution which played a key role during 1965 war in motivating Pakistani troops. Khan made it clear that the federal minister for information has asked the Radio Pakistan management for valuable suggestions to improve its performance by November 1. He further assured them that Fawad Chaudhry would not take any such step without talking Radio Pakistan employees in to confidence.